I am very excited to be writing my first blog post for the LeRoy Farmer’s Market for 2016! LeRoy’s market is in it’s 9th year and so far we have many new vendors as well as our core of veteran vendors. Each week I hope to post what the vendors will be offering as well as which organization will be in the community booth and our music entertainment. Something new this year! Each week the market manager’s tent will feature a different local artist. We are calling it our mini gallery series and are very excited to offer something like this to the community. So far we have a few artists signed up but we have quite a few weeks to fill so if you or someone you know would like to have 3 of their works displayed please give me a shout. Not all of our vendors will start tomorrow in fact some of them will be starting mid-season due to the availability of their produce. Dennis and Donna Mellander of Mellander Maple will have maple syrup in tin, glass and plastic. Also maple cream, maple sugar candy, and maple coated nuts. Starting next week they will have Once Again Nut Butters and Nunda Mustards. 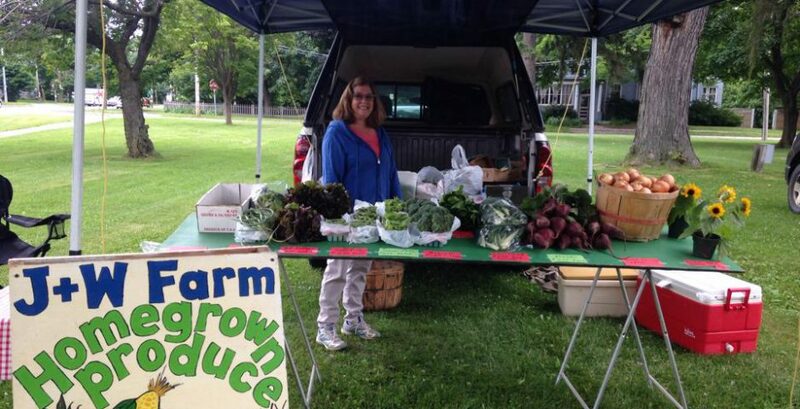 Donna Phillips of Phillips Organic will have some lettuce, Swiss chard and garlic scapes. Nice Farms will have sweet cherries, strawberries, and their maple syrup and maple candies. It’s a Natural Farm will have chicken, eggs and alpaca products. Peg Cox from Peg’s Produce will have fresh cut flower bouquets, pesto pak (garlic scapes and basil) bags of mixed lettuces, Swiss chard, and a few dried flower wreaths. Wayne and Joanne Dries of J&W Farms will have peas, broccoli and beans. Dave Werdein, the honey guy will be there with seasonal flavors of honey like spring and fall, creamed honey, honey sticks, honey butter, lip balm, body butters and seasonal allergy relief honey, plus more! Sounds like a great line-up so far eh? There will be two community booths tomorrow, The Woodward Memorial Library with Summer Reading sign-ups and LeRoy Rotary REAL (Rotary Excited About Literature) will be giving books away free! We round the market out with Bev Hess as our music entertainment for the day. That’s it for now. Hope to see as many of you as possible tomorrow. Thank you for supporting our local farmers market.